Wardrobes have evolved a lot in terms of functionality, design and style. 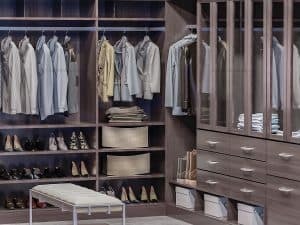 From styles ranging from classic painted closets to sophisticated high gloss and stunning mirror wardrobes and other wardrobes with specialised features, modern wardrobes are becoming more and more complex and useful in meeting the storage needs and other purposes of homeowners. Here are some modern trends that in wardrobe design. Fitted sliding door wardrobes have two specific features that classify it as modern. First off, it is fitted or customised to fit the space allotted for it including the size, shapes and form of the space. In this way, it can be designed to optimise space in any room or house such as loft, cupboard and under the stairs among others. It also maximises the use of available storage space at the same time. Secondly, the sliding door is another modern feature of a fitted wardrobe. This attribute helps save space in any room. The sliding door allows you to put furnishings near the closet without problem of being an obstruction for opening it compared to a hinged door storage units. A sliding door also helps in easing traffic and air flow as it provides more room for people to manoeuvre and move and air to ventilate. And as the sliding doors come in different colours, materials and designs, the sliding doors can provide beauty and contemporary feel to your home. Another modern wardrobe trend is siding mirror wardrobe which have become one of the most sought after styles recently. Aside from having the benefits of a customised wardrobe and a sliding door wardrobe, bespoke mirror wardrobes provide additional elegance and benefits. The mirror further creates the illusion of space in your room by reflecting space and the sunlight. Thus, it helps to make the room brighter. Finally, while mirrors per se have a classic and timeless beautiful on its own, it can still be incorporated with different designs and colours to provide gorgeousness and grace to you room or house. A hinged door is essentially a traditional style of wardrobe. However, a bespoke modern hinged door wardrobe would be more ideal in custom fit spaces where a sliding door would look awkward or gawky. This included uncoordinated spaces with varying shapes. The fitted hinged wardrobe is also sometimes preferred by people to match the traditional style or vintage look of their house design.